In 1908, St George almost joined the New South Wales Rugby League following a meeting at Rockdale Town Hall. At that meeting, a St George Rugby League club was definitely formed with a president and other officials being elected. But the new club was unable to form a team when pressure from the Rugby Union saw only three players sign up. In 1910, a St George Third Grade team entered the competition. They won their first game in convincing fashion, defeating the Newtown Thirds 36-0. On Monday 8 November 1920, at the Kogarah School of Arts, a St George District Rugby League club was formed with the view of entering a First Grade team into the 1921 competition. On St George's Day (April 23) 1921, a St George First Grade side finally entered the Sydney premiership, narrowly losing their first game 4-3 to Glebe. In 1927, St George were runners up and in 1928, they were minor premiers for the first time. In the 1930s, The 'Dragon Slayers' as they were known, were again runners up in 1930, 1933 and 1937. In 1935, St George posted a premiership record when they defeated Canterbury by 91-6 at Saints' old home ground at Earl Park. In 1941, St George finally won their first premiership when they defeated Easts 31-14 at the Sydney Cricket Ground. Saints were runners up in 1942 and again in 1946 before winning a second premiership in 1949. In 1950, St George left Hurstville Oval began their long association with Kogarah Jubilee Oval as a home ground. In 1953, St George were runners up when they went down to Souths in the Final. The St George Dragons cemented themselves as one of the world's greatest sporting clubs when they won and unprecedented 11 straight premierships between 1956-1966. They were undefeated in 1959 and won all three grade Grand Finals in 1963. Immortals such as Graeme Langlands, John Raper and Reg Gasnier were just a few of the greats who wore the red and white during these golden years. The Dragons were Grand finalists in 1971 and 1975 before St George and Parramatta played in the historic drawn Grand Final of 1977, the match ending at 9-all after extra time. The young Saints team came out the following week to defeat the Eels 22-0 in the 'Grand Final replay'. 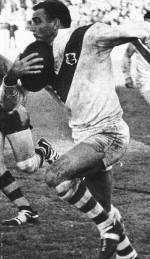 In 1979, St George won their 15th premiership after defeating Canterbury 17-13 in the Grand Final. St George played in five more Grand Finals in 1985, 1992, 1993, 1996, and most recently in 1999 as the 'St George-Illawarra Dragons' following Rugby League's first successful joint venture. To this day, the St George Dragons in their famous 'Red V' jersey are probably the most well known Rugby League name in the world. The Illawarra Steelers entered the premiership in 1982 during one of the game's expansions. Basing themselves in Wollongong, it seemed that their inclusion into the NSWRL Sydney premiership was long overdue. The Southern Division competition has a long history which can be traced back to 1910. In 1946, they beat England 15-12 and did the same in 1950 defeating Great Britain 18-11. Charlie 'Saus' Hazleton was the first Illawarra international in 1937/38 and like many top class players he soon found himself in the Sydney Competition playing for St George (1939 and 1940). The Wollongong area has produced many great players, including Graeme 'Changa' Langlands, 'Slippery' Steve Morris and Rod Wishart. Illawarra Steeler's best year was in 1992 when they finished third on the ladder and made it all the way to the preliminary final before being beaten by St George by just 4-0. In late 1998, Illawarra and St George joined forces to become known as the 'St George - Illawarra Dragons' who went on to be 1999 grand finalists. In September 1998, the St George Dragons and the Illawarra Steelers made history when they formed Rugby League's first successful joint venture, the 'St George Illawarra Dragons'. Overall, this was a popular move as both clubs had many things in common. In 1999 the Dragons almost pulled off a remarkable year when they made the semi-finals and appeared unstoppable as they suddenly hit top form. They went into the Grand Final as favourites but went down narrowly 20-18 in controversial circumstances when Melbourne were awarded a penalty try just before full time. Debates over home ground, club identity and recruitment continued into 2002. In 2003, the St George Illawarra Dragons returned to Kogarah Jubilee Oval for the first time since 1999 with Wollongong and St George districts both sharing home ground matches. This coincided with a club journal announcement that the history of the clubs would unite with the next Dragons Grand Final win being premiership number 16.